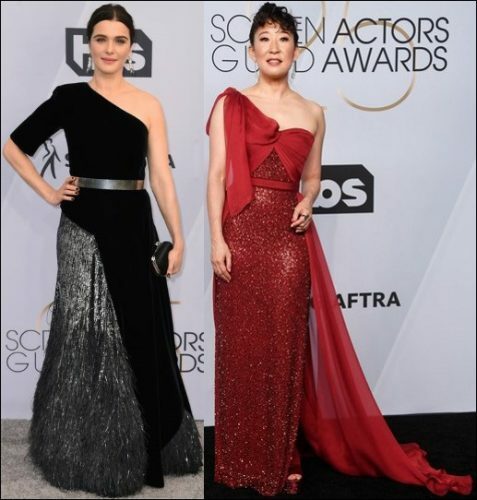 Mixed fabrics, vibrant colors and feathers ruled the red carpet at the 2019 Screen Actors Guild Awards last night. See the trends here! Michelle Yeoh dazzled in an Elie Saab feather-bottom gown. 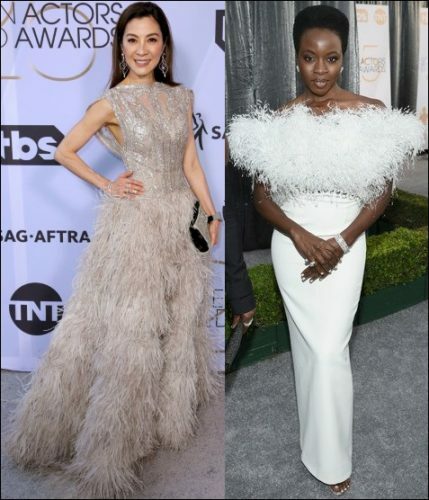 Danai Gurira looked beautiful in a Ralph & Russo white feather top gown. Rachel Weisz wore a one-shoulder short-sleeved black & silver Givenchy feather-bottom gown. Sandra Oh sparkled in red in a one-shoulder Jenny Packham gown. Emily Blunt looked out of this world in a lightly shimmering pink Michael Kors dress. Gemma Chan wore a pink Oscar de la Renta high-low one-shoulder gown. Emily Omsment posed in a sleeveless Rachel Gilbert dress. 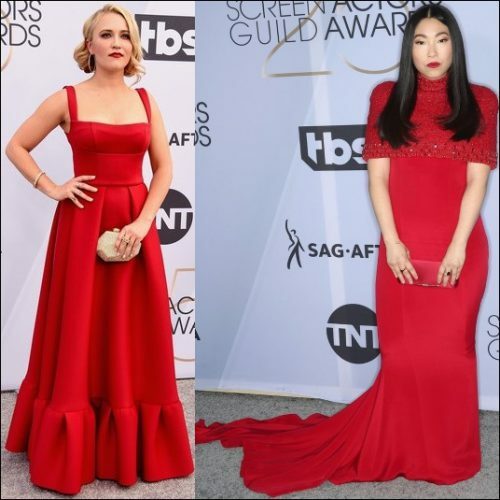 Awkwafina wore a short-sleeved Mimi Plange red gown. Amy Adams posed in a black Celine side-slit dress and Cartier jewelry. Laura Harrier looked lovely in a hot pink voluminous-sleeved Loewe gown. Margot Robbie looked effortlessly beautiful a plunging white and gold floor-length Chanel dress. Lady Gaga showed off some leg in a white Dior Haute Couture gown. 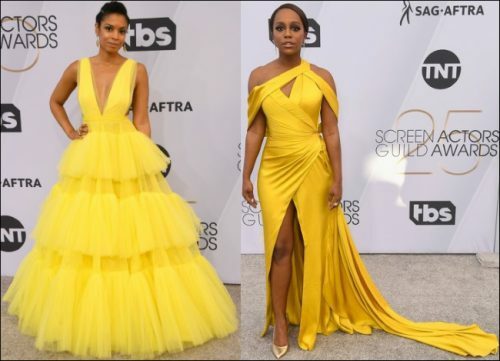 Susan Kelechi Watson looked vibrant in a Christian Siriano tiered yellow tulle gown. Aja Naomi King showed some leg in a golden yellow Ralph & Russo dress.